The owner of a pallet manufacturing business, with facilities in western Iowa and southeastern Nebraska, says they’re still turning out product despite a massive fire over the weekend. The fire destroyed most of Krajicek Incorporated’s operations in Denison, Iowa. Owner Ed Krajicek says the damages exceed one-point-five million dollars. "We were hoping it wasn’t going to be a big loss, but (the fire) just kept going and going," Krajicek said. "It cost us everything we had." 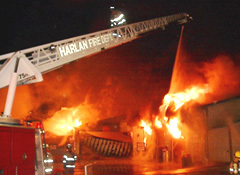 More than 64 firefighters from eight area departments battled the blaze late Saturday night into Sunday morning. A fire gutted the same Denison facility nine years ago this month. "February 15th of 2000," Krajicek remembered. The cause of that fire was never determined and investigators are working to find the source of this week’s fire. Krajicek say the facility will be rebuilt. For now, employees in Denison have set up shop in an outdoor parking lot, while pallet construction is being increased at the Krajicek facility in Crete, Nebraska. "We have about 105 employees that work for us…and all of them will have a job," Krajicek said. Although the business office portion of the Denison facility suffered heavy smoke and water damage, Krajicek says employees were able to save some computers and critical billing materials. The Iowa State Fire Marshal’s office is helping the the investigation.